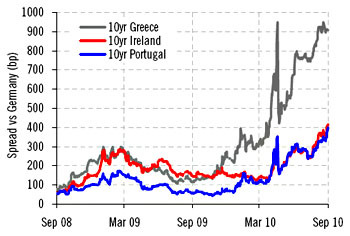 Earlier this year, government bond spreads in several European countries ballooned dangerously in response to the Greek debt crisis. In May the EU came to the rescue, Greece agreed to a combined loan/austerity package, and spreads settled down. The crisis was over. According to one popular analogy currently circulating , the EuroArea countries could be likened to a group of 16 Alpine climbers scaling the Matterhorn who find themselves tightly roped together in appalling weather conditions. One of the climbers — Greece — has lost his footing and slipped over the edge of a dangerous precipice. As things stand, the other 15 can easily take the strain of holding him dangling there, however uncomfortable it may be for them, but they cannot quite manage to pull their colleague back up again. So, as the day advances, others, wearied by all the effort required, start themselves to slide. First it is Ireland who moves closest to the edge, getting nearer and nearer to the abysss with each passing moment. And just behind Ireland comes Portugal, while some way further back Spain lies Spain, busily consoling itself that it is in no way as badly off as the others who have already lost there footing. But if Spain cannot hold out, and all four finally go over, each dragged down by the weight of those who preceded them, then this will leave some 12 countries supporting four, something that the May bailout package only anticipated as a worst-case scenario. This is especially bad news since widening spreads can easily become self-fulfilling prophecies. Greece, Ireland, and Portugal were in big enough trouble already, but high interest rates on their debt could turn a difficult situation into an impossible one, requiring yet another massive bailout that might have catastrophic knock-on effects. And remember: we’re all one big happy global economy these days. If Europe catches a cold, we’re going to catch it too. As a resident of California — #1 on Whitney’s list of disaster areas — I find this all terrifyingly plausible. Buckle your seatbelts.